LOVE's Haven: Heard About Hair Transplant? We always hear from people giving thanks to their surgeons for experiencing successful operations. That’s a vivid example of living in a word of technologies! Fat no more (tummy tuck, lipo)! Low bridged nose to high, soggy face to face lift, kidney and heart transplant, so on and so forth. But guess what? I never thought that hair can be transplanted too! I just heard about New Jersey hair transplant from a friend abroad just recently. I thought re-growing of hair can be just being done through shampoos and medicines but I was wrong. 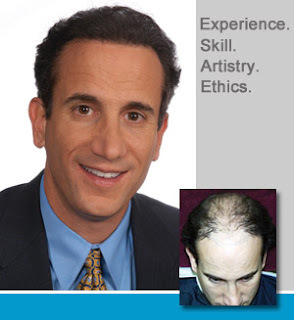 If you or your love ones have a problem on their balding head, then, it’s high time for them to meet a good surgeon like Dr. Pistone. With his affordable price, he can give you back your natural hair and hairline aside from its simplicity and safety. But the best of all, it looks completely normal because it is just your own hair that re-grows along your hairlines. Cool huh! May I tell my FIL so that he can regain his confidence back!